Nothing sweeps a woman off of her feet like a bundle of flowers that have only just been contained. Our experts have worked to display iconic buds in an arrangement sure to knock her off her feet. 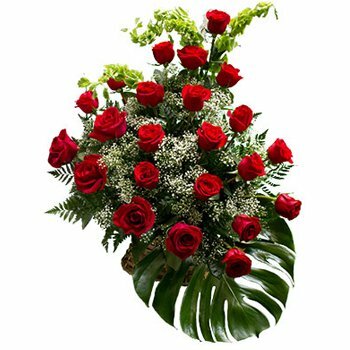 Your recipient will receive 24 stunning red Roses, nestled amongst Greens and more. Celebrate an Anniversary, send a surprise to the office, or earn some brownie points with Cascading Roses.